I SPENT some time on and off in Singapore during my formative younger adult days and as part of that experience I learnt about the painstaking art of preparing Nyonya (Peranakan) cuisine. I say painstakingly because I was told at the onset at all my Nyonya cooking lessons that Nyonya dishes are prepared with love rather than “out of love” because of the time and trouble you have to go to prepare meals. Peranakan is a term used for the descendants of Chinese/Malay “Straits Chinese” with the terms Nyonya referring to Peranakan women and Baba referring to Peranakan males. Peranakan cuisine is based on using Malay cooking techniques and blending distinctive Malay spices with Chinese ingredients. It’s also called Nyonya cuisine because it is the women who usually prepare and cook all the meals in the Peranakan household. Laksa is possibly the best known of the Peranakan dishes. It comes in a few varieties – Assam laksa uses a tamarind soup base and laksa lemak is a coconut curry soup. In Singapore the variety is laksa lemak (or aka curry laksa), and is typically an infused coconut broth containing clams, prawns, fish cake, bean sprouts, tofu and egg with rice noodle – all topped with laksa leaf and sambal. The east coast suburb of Katong is the best place to try it in Singapore and is home to fierce competition between laksa stalls. This rivalry, which has been coined the “Katong Laksa War”, has Singaporeans regularly reporting and blogging who is making the best laksa in the area (which has resulted in some stalls closing if they don’t make the grade). The typical Australian version of laksa tends to be a laksa lemak with either prawns or chicken or a combination of both (anything else such as beef is a bastardization of the dish in my book), with the usual bean sprouts and fried tofu and fish cake with vermicelli or egg noodles. Laksa has to be made well and the difference between a great laksa and a fair laksa is the paste and the stock. As my Nynoya teachers told me it’s also got to be made with love. I was taught that every ingredient for the paste should be pounded in a mortar with each ingredient added one at a time to blend and be smashed painstakingly for up to an hour (smashing is better than using a food processor as it just cuts the ingredients). One of my Nynoyas said with all the effort it took to make laksa it had to be love that drives you and another proudly proclaimed the constant smashing and pounding was also good for stress relief – (i.e. she would rather smash spices and herbs than her baba). After completing the paste the making of the stock is the next big step with the simmering of prawn shells or chickens. Finally, every bean sprout must be detailed as the stringy tails are bitter and don’t meld well with the finished product. Unfortunately, in Australia, laksa is usually made with commercial pastes. Not so at one busy restaurant which I believe makes one of the best laksa in Australia – Temasek in the western Sydney suburb of Parramatta. Temasek is the Malay word for Singapore and the restaurant is tucked in a narrow arcade that runs along the restored art deco Roxy theatre. It’s a bit reminiscence of a lane way Asian restaurant with every square metre taken up by a table or seat and is sparsely decorated with a few framed Singapore tourism posters adorning the walls. I popped into Temasek for a quick lunch one weekday and got there deliberately early (around noon), knowing from past experiences it would get busy. Already the place was seething with office workers and families but I was able to get the last seat (a small table for two outside in the lane). The menu features some classic Hawker stall gems besides laksa: Hainanese chicken rice ($16.80); mee siam ($11.80); fried Hokkien prawn mee ($13.80); char kway teow ($12.80) and mee goreng ($13.80). 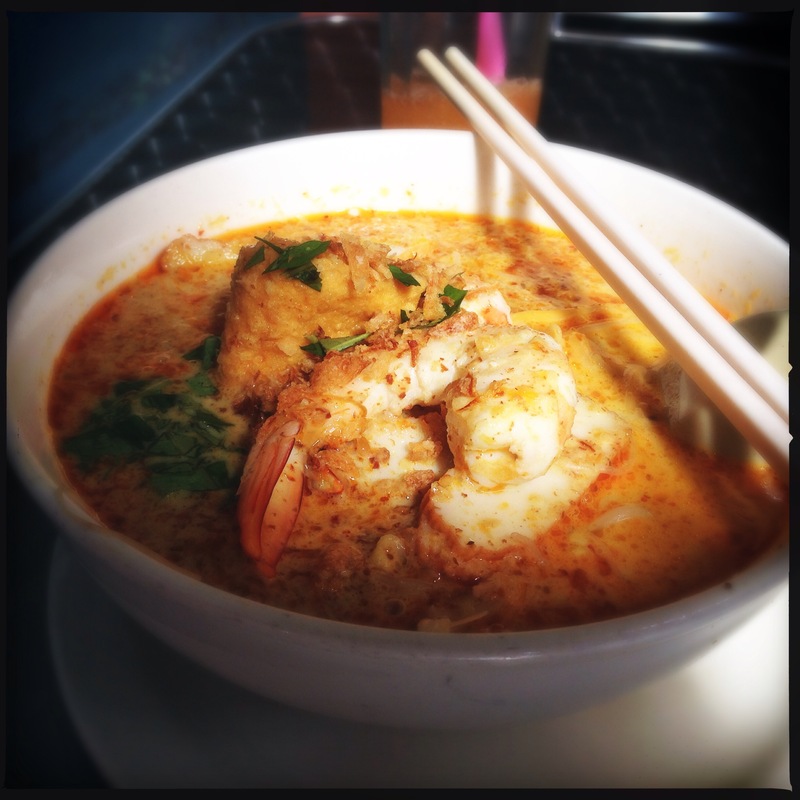 I made the effort to come to Temasek for one dish only – prawn laksa ($14.80). I also ordered an iced lemon tea ($3). You can tell before you take your first sip that Temasek’s laksa is going to be good. Glancing into the bowl before you are chopped green laksa leaves and smashed up other fragrant goodness floating in the soup. The sprouts have been detailed and the stock smells that it’s been made with love. The broth is spicy and sweet with hints of galangal, onion, chilli and shrimp paste. The bowl has a good clump of fried tofu, king prawns, fish cakes and thin rice noodle (essential as the pastes solids stick to the fine noodles making it a wonderful mouthfill) . A topping of spicy and char-flavoured sambal paste is delightful when mixed into the soup. 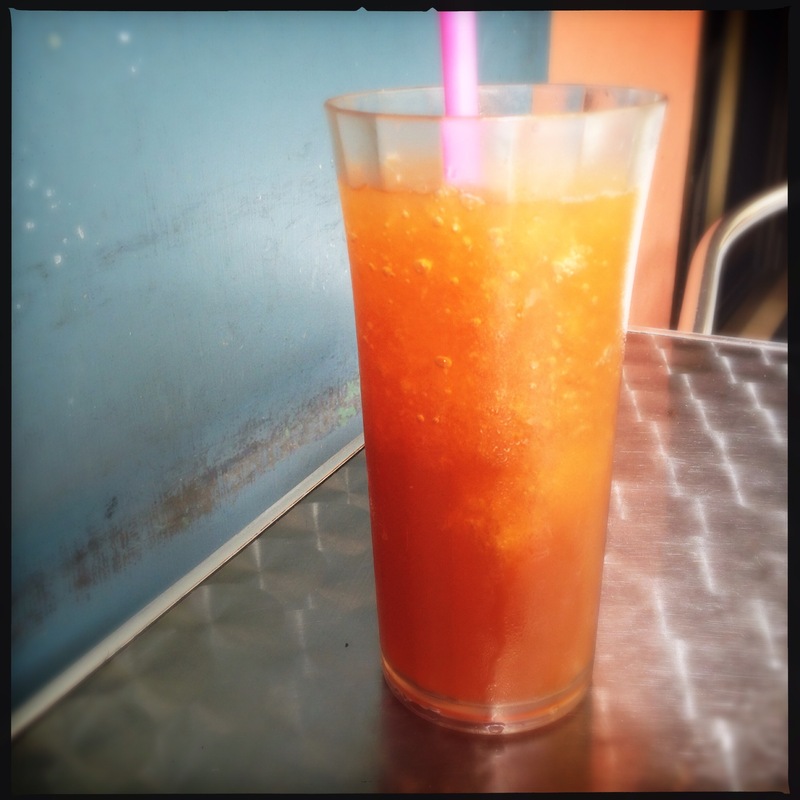 The iced tea is reminiscent of the teas from drinks stalls in Malaysia or Singapore – icy and sweet with a nice tang . It’s perfect for a warm day and helps round out the palate when eating spicy food. Service at Temasek can be slightly hit and miss – especially when staff are trying to serve a full restaurant and deal with the bedlam of people queuing for a spot – but if you like Hawker food or want to be reassured that people can serve up a decent laksa outside of Singapore – Temasek should be visited. The verdict: Sydney’s, if not one of Australia’s, best laksa. Be prepared to queue. It’s the food that counts and not the decor. What: Temasek, Roxy Arcade, 71 George St, Parramatta. Phone (02) 9633 9926. Open Tuesday to Sunday for lunch from 11.30am to 2.30 pm and dinner from 5.30pm to 9.30pm. This entry was posted in Chinese, Hawker food, Malaysian, New South Wales, Singaporean, Sydney and tagged Katong, Laksa, Laksa Lemak, Nonya, Parramatta, Peranakan, Singapore, Temasek. Bookmark the permalink. I love Tamasek! It is one of the small number of redeeming features Parramatta has to offer.